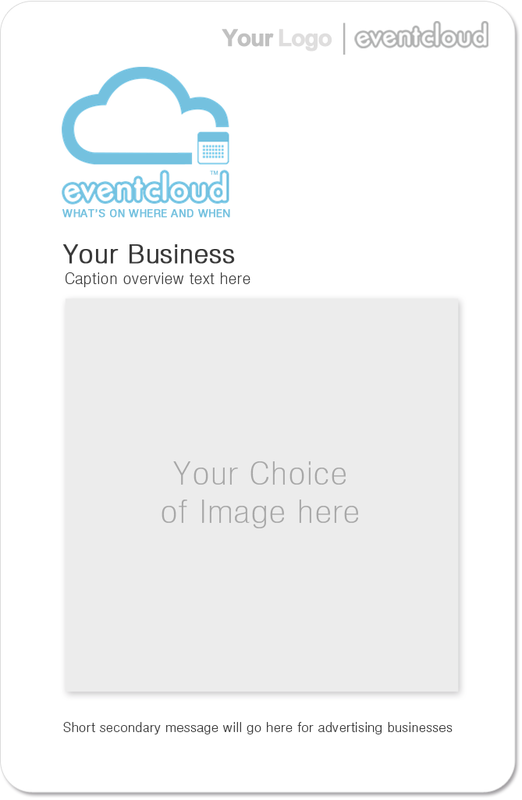 Join eventcloud™ today! It's quick, simple and seriously affordable. No Personal Image/Logo or Map on Free Listings. Event Title, Date, Address, Telephone Number, SEO Centre, Send to a Friend, Add to Favorites. Create a Premium Listing today for a one time fee regardless of the time you want to advertise. Premium Events appear in search results above the Basic Events. Event Title, Date, Time, Personal Image/Logo, Address, Telephone Number, Summary Description, Ticket URL, SEO Centre, Send to a Friend, Add to Favorites. Create a Showcase Listing today for a one time fee regardless of the time you want to advertise. Showcase Events appear in search results above Premium and Basic Events. Event Title, Date, Time, Personal Image/Logo, Address, Map & Location Tuning, Telephone Number, Email, Website Link, Summary Description, Get Directions, Contact Name, Detail Description, Ticket URL, SEO Centre, Send to a Friend, Add to Favorites, Print. Full Personal Landing Profile Page, Add to Calendar Feature, Facebook Location feed Integration, Gallery Feature. No Personal Image/Logo or Map. Title, Address, Telephone Number, Send to a Friend, SEO Centre, Add to Favorites, Ratings and Reviews. No Personal Image/Logo or Map. Basic level listings appear in search results above Free listings. Title, Address, Telephone Number, Website URL, Email Link, Send to a Friend, Add to Favorites, Ratings and Reviews. No Personal Image/Logo or Map. Premium level listings appear in search results above Basic and Free listings. Title, Address, Telephone, Website URL, Email Link, Summary Description, Send to a Friend, Add to Favorites, Designation Icon, Ratings and Reviews. Title, Personal Image/Logo, Address, Telephone, Website URL, Email Link, Summary Description, Detail Description, Send to a Friend, Add to Favorites, Designation Icon, Ratings and Reviews. Full Personal Landing Profile Page, Facebook Integration, TripAdvisor Link, Gallery Feature, Map, Add Promotions & Coupons, Contact Form, Video Snippet. Post your article and become known to prospective clients and customers. Contains summary View and Detail View. Title, Publication Date, Author, Abstract, Image, Photo Caption, Photo Attribute, Photo Gallery, Send to a Friend, Add to Favorites. Return on Investment - Start getting customers in minutes! What you will get in your package? 2,500 Mini personal promotion cards Printed and Distributed in a selected location. Mini sponsorship cards are personal to you and allow you to be seen as a strong brand against all others. Cards are the same size as a credit card and are easily kept by potential passersby's unlike other conventional flyers. A selected day and time of your choice for our unique cloud buggy to go out and promote you personally. Chose a window of your choice on a selected day and time. Day time promotions are inclusive as part of this package deal and after hour's promotions any time after 6pm are subject to additional costs, this can be found in the pricing section below. FREE Showcase Venue and Resort listing for the year online. Give your Venue or Resort one of our Top listings it can have by showcasing it with all of its glory. Your listing will show on National Events landing pages as well as Search Result pages, this will stand out more predominantly than other free, basic or premium listings and it will also have its very own separate landing page with gallery and personal map locations, promotions attachment feature, plus tied in social links such as Facebook, Twitter and TripAdvisor. Not only will you get all of the above but you will also be given an exclusive £50 account credit that you will be able to use on whatever you like. This will allow you to upload events or custom category related adverts/banners as and when you please with no outstanding balances to consider throughout the duration of your applied credit. The eventcloud buggy is the first promotion tool of it's kind, making it the most unique way to promote your Event, Venue, Resort or Attraction. We have created a beautiful little vehicle that can be driven around cities/towns, shopping malls, festivals and many other public places. It is sure to turns peoples heads, capturing their interest like no other form of advertising! Also on days or nights out promoting this little fun buggy will include our very own Superhero (eMan) who will be driving and engaging with the public making sure your message is seen! Flyer distribution can be a very challenging process with your message only hitting a small percentage of your target audience. Our Buggy entices its audience with curiosity and once that is gained we can hand them a small sized promotion card for your Event, Venue, Resort or Attraction. People are more likely to keep our mini-cards as they are not too big and are a great design that easily fits in your wallet or pocket. This in essence is effectively more efficient than usual promotional flyering in regards to approach and presentation. The portability of this fun little Buggy is a huge factor. This can be driven in or around Shopping Malls, Colleges, Universities, Parks or Festival Events! It also has the option to play music of your choice or a promotional jingle, blow's smoke in authorised areas and has a top speed of a whopping 6MPH! The eventcloud promotion and marketing team are here day and night for you! If you would like submit your interest, purchase one of our packages or discuss things further then simply click on the Contact Us link below stating your requirements and interest. A member of our team will review your submission and get back to you with an overview and breakdown with the terms of your service. This package will allow on average a two hour selected time window of your choice anytime between 8am-6pm. These are great for catching work people in the day on lunch breaks or visitors/tourists and general passers by going about their day. This package will allow on average a two hour selected time window of your choice anytime between 6pm-1am. Great for the direct targeting of active events or going's on at the time. Generally people on a night out looking for entertainment or a retrete. City locations may be subject to additional travel costs based on current or previous location of bookings. Package is inclusive of a 20 mile travel radius and then is charged at 30p per additional mile from current location. Copyright © 2017 eventcloud Ltd. All Rights Reserved.